Background: Membrane filtration process produced good quality of permeate flux due to which it is used in different industries like dairy, pharmaceutical, sugar, starch and sweetener industry, bioseparation, purification of biomedical materials, and downstream polishing etc. The cross-flow mode of operation has also been used to improve the quality of the Rubber Industrial effluent of Tripura, India. Method: The Computational Fluid Dynamics (CFD) simulation of the cross-flow membrane is done by using ANSYS Fluent 6.3. The meshing of the geometry of the membrane is done by Gambit 2.4.6 and a grid size of 100674, the number of faces is 151651 and number of nodes being 50978 has been selected for the simulation purpose from the grid independence test. We have revised and included all patents in the manuscripts related to the membrane filtration unit. Results: Single phase Pressure-Velocity coupled Simple Algorithm and laminar model is used for the simulation of the developed model and Fluent 6.3 used for the prediction of pressure, pressure drop, flow phenomena, wall shear stress and shear strain rate inside the module is studied for cross flow membrane. Conclusion: From the study, it has been found that CFD simulated results hold good agreement with the experimental values. 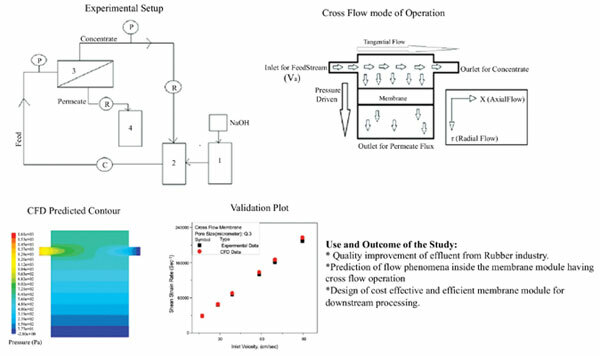 Computation fluid dynamics, downstream processing, membrane, wastewater, rubber industry of Tripura, cross-flow operation.